Announcing the Hygge Home Crochet Along! The Hygge Home Crochet Along is the first crochet along of 2019 hosted in the CAL Central Facebook and Ravelry groups. We’ve brought together ten of the top crochet designers out there to bring you free crochet patterns for making your home more cozy, comfy, and hygge. Two of our favorite companies are providing prizes for our end-of-CAL giveaway. Join us to make great projects for your home, chat with other crocheters, and enter to win fabulous prizes! Enter the 2019 Hygge Home CAL End-of-CAL Giveaway. Every Monday from January 14 through March 18, 2019, we’ll share a free crochet pattern to make your home more cozy, comfy, and hygge! You can make these home decor projects to keep, for gifts, or to donate to charity while chatting with other crocheters in our groups and sharing your projects to win giveaway prizes! Are you new to the Danish concept of hygge? You can read more about it — and learn to pronounce it — here. Red Heart Yarns has generously provided each participating designer with yarn for this crochet along, so all of the patterns will be made with Red Heart. Red Heart and Darn Good Yarn have also generously provided us with prizes for this CAL. Share your completed project pictures below by 11:59 p.m. Eastern on Monday, March 25, 2019 to enter for your chance to win! You can join in by crocheting the patterns as you have time. Share your progress and post pictures of your finished projects. Tag your projects and posts #CALCentralCrochet and #HyggeHome on all social media. If you use Red Heart Yarns for your project, tag @redheartyarns and use hashtag #redheartyarns, too. If you’d like to chat with other crocheters, join the CAL Central Facebook group or visit this thread in the CAL Central Ravelry group. By the end of the CAL, you’ll have up to 10 awesome projects. Make your home hygge while having fun with us! Use this button below on your Ravelry project pages or elsewhere on social media. Right click (on desktop) or tap and hold (on mobile) to save. This list will be updated during the CAL to include links to each pattern as it is released. Crochet at your own pace. March 25, 2019: Deadline for entering the end-of-CAL giveaways (see below for more details and to enter). Everybody knows that CAL Central gathers up the best crochet along prizes from around the web. Read on for more details about the prizes and how to enter for your chance to win. One winner will $100 in hygge yarns from Red Heart Yarns. Show your support by following Red Heart Yarns on Instagram | Facebook. One winner will win a handmade wooden yarn bowl — the perfect way to display your yarn in your hygge home — from Darn Good Yarn. Show your support by following Darn Good Yarn on Instagram | Facebook. Continue on to learn how to enter the giveaway for your chance to win one of these fabulous prizes! This is the end-of-CAL giveaway for the 2019 Hygge Home Crochet Along. The Crochet Along is hosted by CAL Central and the giveaway is organized by Underground Crafter. To enter the end-of-CAL giveaway for one of the prizes described above, share one picture of each project you completed using a 2019 Hygge Home Crochet Along pattern by 11:59 p.m. Eastern on Monday, March 25, 2019. Each completed project will count as one entry into the giveaway. If you do not wish to share a project picture, you may also enter by mailing a letter with your name, the name of the CAL, and your email address (so we can contact you if you win) to Underground Crafter, Planetarium Station, P.O. Box 340, New York, NY 10024 USA. The letter must be received by Monday, March 25, 2019 to be eligible to win this end-of-CAL giveaway. You are not required to use a link to enter, but if you do, please link directly to the project on your blog/Ravelry/Instagram and not to your main page. If you are new to InLinkz Link Ups, you can find a tutorial here. Two winners will be chosen from the entries at random. Each will win one of the prizes listed above. Winners will be contacted approximately one week after the entries close. Winners will have two weeks to claim their prizes. If winners do not respond within two weeks, prizes will be awarded to alternates. The names of winners will be made available in list form by request from Underground Crafter. This giveaway is open worldwide, except where prohibited by law. Don’t forget to join the fun in our Facebook and Ravelry groups, too! You can share as many pictures as you like in the groups, but only pictures submitted here will be entered in the giveaways. Author Underground CrafterPosted on January 14, 2019 March 18, 2019 Categories CrochetTags 2019 hygge home crochet along, CAL, cal central, crochet a long, darn good yarn, red heart10 Comments on Announcing the Hygge Home Crochet Along! I’m sharing a gift guide of four subscriptions for creative types. Subscriptions are fun gifts because they keep on giving throughout the year. Creative types love to make things, so gifts that are filled with creative ideas or supplies will keep them inspired. This roundup includes digital subscriptions and subscription boxes. This post contains affiliate links. I may receive compensation (at no added cost to you) if you make a purchase using these links. I was provided with products by Darn Good Yarn and Nonna Box for review. Although I accept free products for review, I do not accept additional compensation, nor do I guarantee a positive review. My reviews are based entirely on my honest opinions. CreativeBug is an online platform with thousands of classes in crochet, knitting, sewing, quilting, papercrafts, and more! Classes are available for a variety of skill levels, including beginner, for your creative friends who want to branch out into new crafts. And, CreativeBug donates 5% of every dollar earned to non-profit organizations that support art education. 3-, 6-, and 12-month gift subscriptions are available. If the recipient is already a subscriber, your gift will add more time to their subscription. Darn Good Yarn is an awesome company that brings ethically sourced, environmentally friendly, and beautiful yarns and other products to crafters all over the world. I first experienced their products when I designed the Silk Elegance Shawl. The Fabric of the Month subscription is just one of Darn Good Yarn’s subscription options and it’s an affordable way to gift gorgeous and unique fabrics from India and Nepal to your favorite sewist or quilter every month. …with a note about the subscription, 3 pieces of fabric (each of which is at least the size of a fat quarter), and a sample card of yarn or ribbon. If you like the story of Darn Good Yarn but your friends and family don’t sew, you can also try their two subscriptions for crocheters and knitters, Yarn of the Month and Premium Yarn of the Month, or their subscription for jewelers and other crafters, Beads of the Month. Subscriptions are available on a monthly basis and are auto-renewed on the first of each month, so you can create your own gift subscription of your preferred length. To gift a subscription, just enter the recipient’s shipping address at check out. Nonna Box is a monthly subscription box perfect for foodies, those with wanderlust, and Italian-Americans hoping to get a taste of the home country every month. Each box has a regional theme, stories about the region, artisanal treats, and recipes. I wish I could tell you how good everything tastes, but this box went pretty quickly in my house. I didn’t even eat all of it myself! I loved the corn cookies, which were a treat I had never tried before. The instructions for making the mushroom risotto are very straightforward. Nonna Box has gift cards that can be used for tasty Italian goods a la carte or so the recipient can order a subscription. Melody is the talented crochet and knitting designer behind Melody’s Makings. She just launched her own subscription box, Unwind. Each box includes yummy treats, inspiration, and yarn, so Unwind is a great gift for crocheters or knitters. Shipping is free within the U.S. One-time payment gift options are available for 3- and 6-month subscriptions if you’d like to gift a subscription. Today we announced the third annual 2017 Holiday Stashdown Crochet Along. In this post, you can find out more about the prizes in the end-of-CAL giveaway. You can also enter here through January 8, 2018 for your chance to win one of the prizes! Read on for more details. This post contains affiliate links. I may receive compensation (at no added cost to you) if you make a purchase using these links. Materials for this post were generously provided by Clover USA and Polaroid. Images are copyright the respective sponsor and are used with permission. One winner will receive the prize bundle pictured below, including four balls of Premier Yarns Aurora in 1028-05 Woodland, a Deborah Norville Birch crochet hook, and a Premier tote bag. One winner will receive three patterns of their choice from Anastacia’s Ravelry shop. One winner will receive a Clover Takumi Interchangeable Tunisian Crochet Combo Set. Clover was generous enough to send me a set to sample. You can watch me unboxing it in this video. One winner will receive one pattern of their choice from Leah’s Ravelry shop. One winner will receive a Handmade Wooden Yarn Bowl AND a set of three Ombre Wooden Crochet Hooks, pictured below. One lucky winner will receive the yarn bundle pictured below, which includes five skeins of Berroco Comfort DK yarn, a nylon/acrylic blend. One winner will receive a full sized, hand turned, ergonomic crochet hook. The pictured sample is one currently listed in the shop; the winner’s hook may be different. One winner will receive their choice of a Schnauzer Mug Cozy crochet kit (pictured below) or Dog Mug Cozy crochet pattern bundle (with 6 designs of the winner’s choice). Two winners will receive an annual subscription (or a 12-month extension to an existing subscription) to I Like Crochet. You can see the current issue’s cover below. One winner will receive a Crochet Feeds My Soul Project Bag, pictured below. One winner will receive the PDF crochet pattern of Hand Cozies – Women’s Fingerless Gloves, pictured below. One winner will receive a bundle of Leisure Arts crochet books. One winner will receive a MillaMia Aran Ombre 5 Ball Color Pack in the winner’s choice of colors. The Teal pack is pictured below. One winner will receive one set of 30 Signature Personalized Sew-In Labels in the style pictured below. One winner will receive three patterns of their choice from Rhondda’s Ravelry shop. One winner will receive an OttLite lamp. The pictured sample is the 13W Craft Space Organizer; the winner’s lamp may be different. One winner will receive the winner’s choice of Polymer Clay Covered Susan Bates or Boye Crochet Hook with a Long or Standard Handle. The pictured sample is the Susan Bates Little Red Riding Hood Fairy Tale Hook; the winner’s hook may be different. One winner will receive a PDF pattern of their choice from the Rebeckah’s Ravelry shop. One winner will receive a bundle of Search Press crochet books. One winner will receive 3 PDF patterns of their choice from Heidi’s Ravelry shop. One winner will receive handmade polymer clay stitch markers. The pictured sample is the Donut Stitch Markers; the winner’s stitch markers may be different. One winner will receive the Crochet Abbreviation Zippered Tote Bag, pictured below. Now that you know all about the great prizes, let’s talk about how to enter the giveaway! Holiday Stashdown CAL 2017 Giveaway! This is the giveaway page for the 2017 Holiday Stashdown Crochet Along. Get the full schedule and learn more about the 2017 Holiday Stashdown CAL here. To enter the end-of-CAL giveaway for your chance to win one of the prizes listed above, share share a picture of your completed Holiday Stashdown CAL projects using the link up below by 11:59 p.m. Eastern on Monday, January 8, 2018. You may share one picture of each project you complete using a Holiday Stashdown CAL 2017 pattern. Each completed project will count as one entry in the giveaway. Twenty-four giveaway winners will be chosen from these entries at random. Each will win one of the end-of-CAL giveaway prizes. The Silk Elegance Shawl is a stunning rectangular shawl with a curved, motif border. Made with a luxurious and eco-friendly reclaimed silk yarn in beautiful, herbal dyed colors, it’s the perfect accessory for any outfit. This pattern uses simple stitches, making it a great project for beginners, or for more advanced crocheters looking for a relaxing project. This post contains affiliate links. I may receive compensation (at no added cost to you) if you make a purchase using these links. This post is sponsored by Darn Good Yarn, but the opinions and thoughts are my own. Earlier this year, I became an affiliate of Darn Good Yarn, an indie yarn company that combines a social mission with some awesome yarn. It was founded in 2008 by a U.S. Air Force veteran. Darn Good Yarn focuses on yarns made from upcycled and reclaimed fibers. 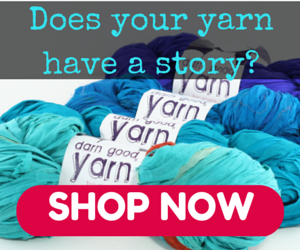 Darn Good Yarn also works with women in India and Nepal to provide a sustainable income. You can watch the story of Darn Good Yarn below. Since it started, Darn Good Yarn has expanded beyond yarn. They also sell yarn bowls, yarn swifts, beads, skirts made from the same upcycled materials, and more. I originally heard about Darn Good Yarn from my friend Rhondda at Oombawka Design. (You can get Rhondda’s latest pattern in Darn Good Yarn Roving Silk yarn, the Itsy Bitsy Tiered Air Plant Holder, here.) Though I completely trust Rhondda, I didn’t feel comfortable endorsing Darn Good Yarn (even with their awesome mission!) until I, you know, actually used the yarn. I was so excited when the Herbal Dyed Recycled Silk DK yarn in Maine Coastline (at top) and Vintage Rose (at bottom) arrived in the mail. The yarn was beautifully packaged and included a card that tells the story of the Darn Good Yarn. As the name suggests, Darn Good Yarn Herbal Dyed Recycled Silk DK yarn is handmade and hand dyed. The silk is upcycled Anamika silk that is fairly traded. It’s dyed with natural herbs, flowers, and plants so its a completely sustainable product. The colors are soft and beautiful and the yarn is so so so soft. It was a lot of fun to work with. Are you ready to hear about the shawl? I wanted to design something simple that would let the colors tell the story of this yarn, but I didn’t want the shawl to be too plain. I mean, the yarn is a show-stopper, so the shawl should be, too, right? The Silk Elegance Shawl actually starts with the bottom border, made of simple, one round circle motifs that are joined-as-you-go. Once you have the border set up, you’ll create a joining row that lays the foundation for the rectangular body of the shawl. Then, you’ll use a simple mesh pattern with stripes to finish up. Just to give you an idea of how this shawl looks when stretched out, I took a picture of it over the couch. I used all 10 colors in both packs, but I rearranged the order. You could follow my colors, work through each skein until it is finished, or choose another color combination. I hope you enjoy the Silk Elegance Shawl! I’m looking forward to wearing mine the next time I’ll be in some overly air conditioned place. And, if you’re not quite ready yet to get two packs of Herbal Dyed Recycled Silk DK yarn as your first sample of Darn Good Yarn, try their Yarn of the Month subscription. You can choose from $10/month or $29/month options. They also have a great clearance section that has deals on yarn, yarn bowls, swifts, and other related products. If you make your own Silk Elegance Shawl, I’d love to see it! Share your progress and questions by tagging me on Facebook as @Underground Crafter, Instragram as @ucrafter, or Twitter as @ucrafter. You can also share a picture in the Underground Crafters Facebook group. Sign up for my weekly newsletter and get a coupon code for your choice of one of my premium patterns and other subscriber goodies. Plus, you’ll never miss one of my free patterns again! Add the Silk Elegance Shawl to your Ravelry favorites or queue. Beautiful colors and a smooth, silky drape combine in this rectangular shawl with a curved motif border. Adult: 61” (156 cm) wingspan x 14.25” (36 cm) spine. Darn Good Yarn Herbal Dyed Recycled Silk DK yarn (100% reclaimed silk, 1.75 oz/50 g/150 yd/137 m) – 1 pack each (including 5 balls of yarn) in Maine Coastline and Vintage Rose, or approximately 105 yd (96 m) in each of 10 colors in any light weight silk yarn. Motif = 1.5” (4 cm) diameter in pattern. Exact gauge is not critical for this pattern. Shawl is crocheted from bottom to top starting with motif border. Motif border is crocheted in the round with the RS facing. Ch 2 at beginning of motifs do NOT count as stitches. Shawl body is crocheted flat in rows. For more stability, insert hook under both loops when working dc stitches on shawl body. For shawl body, change color in last yarn over of final st of Rnd. Ch 4, sk 3 ch, join with sl st to next ch to form ring. Rep Motif 3 – 32 more times, or until desired length is reached, ending with an odd number of Motifs. Rows 4-39: Rep Rows 2-3 – 18 more times, or until desired width is reached. Fasten off. With yarn needle, weave in yarn tails. Spray block if desired. © 2017 by Marie Segares (Underground Crafter). This pattern is for personal use only. You may use the pattern to make unlimited items for yourself, for charity, or to give as gifts. You may sell items you personally make by hand from this pattern. Do not violate Marie’s copyright by distributing this pattern or the photos in any form, including but not limited to scanning, photocopying, emailing, or posting on a website or internet discussion group. If you want to share the pattern, point your friends to this link: http://undergroundcrafter.com/blog/2017/07/11/crochet-pattern-silk-elegance-shawl. Thanks for supporting indie designers!